This starship is headed for stars unknown, and the crew depends on your skills and judgment. 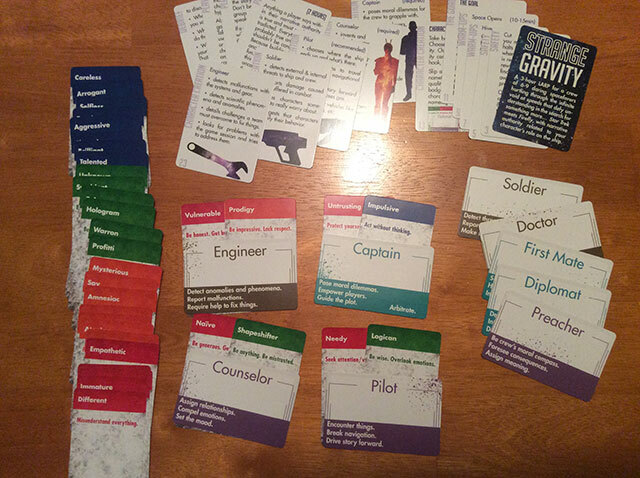 Each player takes the role of an officer on a starship, with the narrative authority related to that role. • Explore a universe inspired by your favorite space tv series. • Confront danger, emotions, and moral quandaries. • Will you use your narrative power wisely? This is a Live-Action Roleplaying Game that uses improv skills and focuses on style. 9 unique emotional qualities — How does you interact with others? 9 unique plot qualities — What's your secret past and when will it haunt you? 9 unique physiological qualities — What ARE you? Aliens and more! 9 unique traits — Why are you so special? 2 copies each of 9 unique role cards which combine to create your badge. Are you the Captain or the First Mate? The Doctor or the Soldier? The Diplomat or the Counselor? A free 8-page rule booklet PDF, printable on two 8.5"x11" sheets if you prefer that to the rule cards. 16 double-sided cards form the rules document, with section headings for easy reference. I played this at a convention, so can't review it (no purchase), but wanted to say it was an excellent game that really gives the feel of being on a tightly plotted TV drama. In addition, the structure is well balanced to keep all players involved in the play and entertained.